From the New York Times Sunday Magazine, Marginal Revolution, Coordination Problem, CNBC, Econlog, the Financial Review of Books, CNBC again, CNBC again, RealClearMarkets, CNBC again, the Wall St. Journal, the Weekly Standard, 24 Ore (Italy), Corriere della Sera (PDF), Mark Hannam (one of the world's most intelligent and well-informed financial bloggers), 24 Ore again, CNBC again and once again (each CNBC link deals with a different regulatory aspect of the financial crisis, many of which we were unaware of when we wrote the book--they are all worth reading). Here is the American Library Association's "Choice" magazine review of the book, and its subsequent announcement that the book has been named one of the "Choice" top 25 academic titles of 2012. So far, all praise--where is the pushback? Surely we must have made at least one big mistake! all praise--where is the pushback? Surely we must have made at least one big mistake! 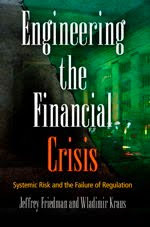 Corrections to "Engineering the Crisis"